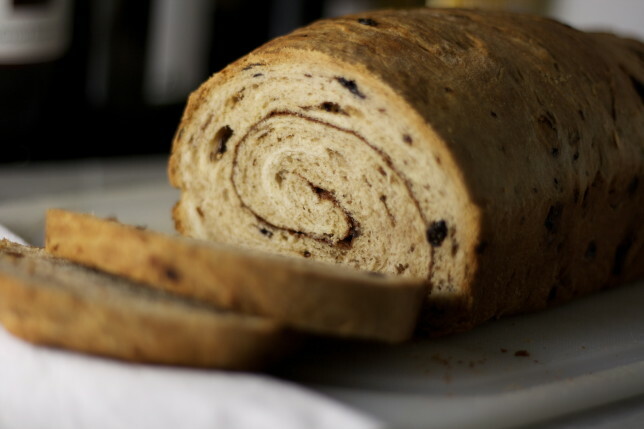 There are, in the great encyclopedias of cooking and baking, very few things that require as little written embellishment as the humble cinnamon raisin swirl bread. It is perfect the way it is: sliced fresh, toasted with butter. The aroma wafting from a toaster as it crisps it up smells like childhood, like home. Never complacent to buy a loaf of something that’s been packaged in plastic, when I saw a recipe for it on the Tasting Table, I had to get it in my oven. I am possibly one of the biggest proponents of no-knead bread, but there was something about this recipe that called to me. The pictures looked so much more like what I remember than any other I’ve seen online. So for my first loaf, I did as the instructions said, and kneaded that sucker by hand. It certainly was not a disaster, but yet a cautious tale for the weak. If you, like me, have little upper body strength (or a counter that’s too high for your stature — maybe we can blame that instead, maybe? ), it will take an absurdly long time to knead it to the smooth, stretchy consistency it needs to be. Longer than the 15 minutes the recipe says is required. If you have no stand mixer, meditate a little on a big hunk of dough. If you do have a stand mixer, however, take the shortcut, like I did the second time, and knead it there. 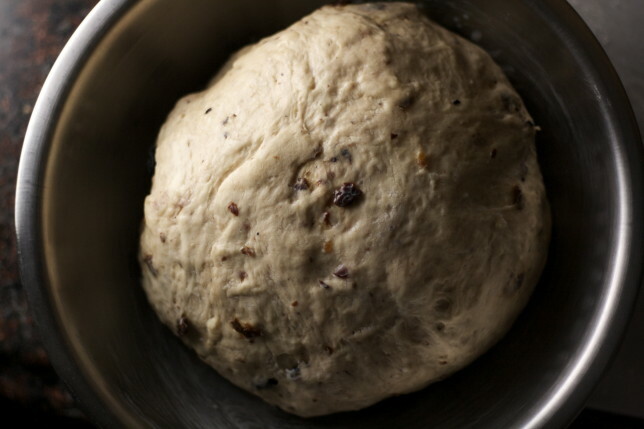 What resulted was a dough speckled with whole raisins and flecks of raisin bits. It changed the all-white bread flour to that lightly caramel color we know so well from our beloved packaged loaves. Yes, instead of sprinkling raisins into the swirl, you chuck them directly into the dough. 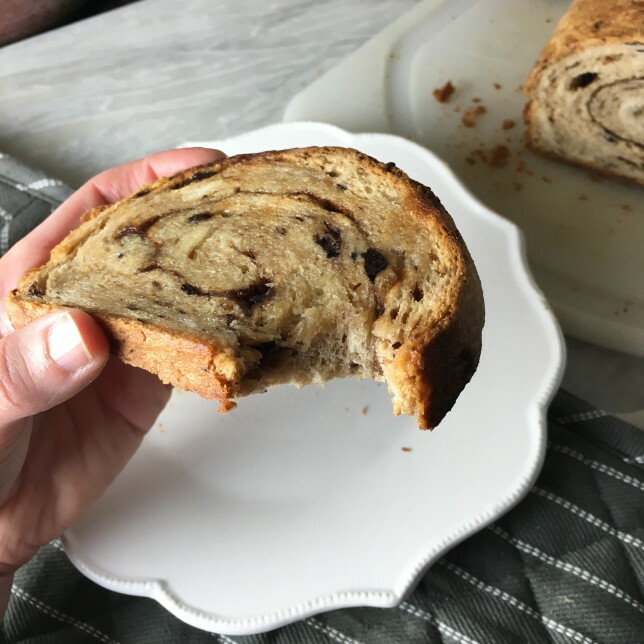 After it’s risen, it’s pressed into a rectangle, sprinkled with cinnamon and sugar, and, like a batch of cinnamon rolls, rolled tightly into a log. But instead of slicing it, its ends are sealed, and it’s placed lovingly in a loaf pan. After its second rise it’s brushed with butter and sent into the oven to bake. What I love about baking bread is that my apartment smells like it’s turned into a Parisian boulangerie — yeasty, warm, delicious. 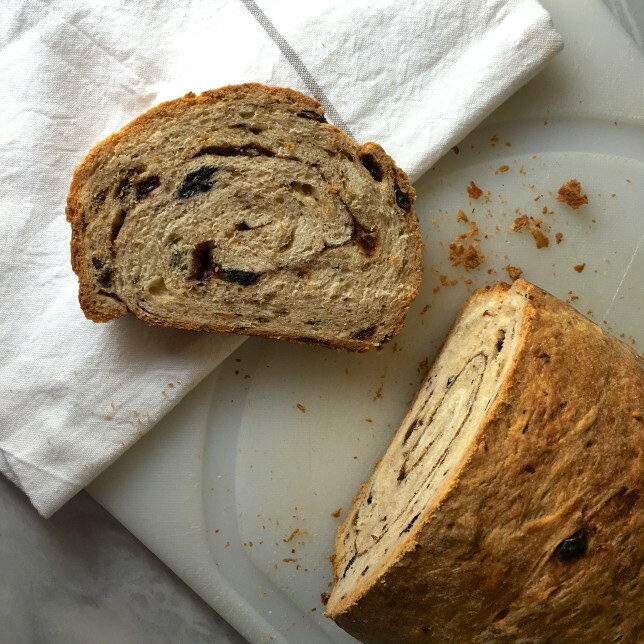 Infuse it with the seductive scent of cinnamon, sweet raisins and lightly caramelized sugar, and that boulangerie is transported. You’re now in a magical scene in your favorite children’s book. 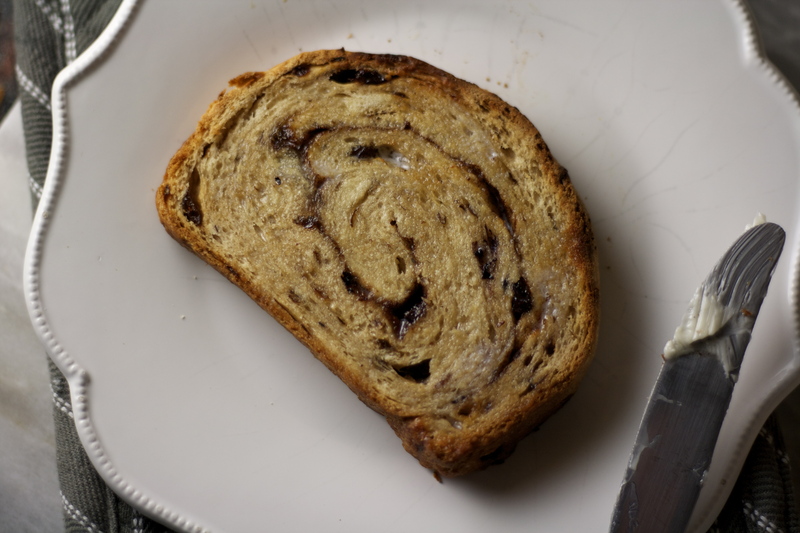 Unlike luscious cinnamon rolls, this bread is lean. It feels okay to eat a few slices at a time. Paired with some eggs, or topped with peanut butter and banana, don’t try to tell me that it’s not part of a complete meal. It might also just make you feel like a kid again. This recipe urges you to knead by hand, and by all means, do it if you’ve got the time and the strength! Using my stand mixer with the dough hook, though, made it much more manageable. The bread was springier and lighter. I’ve included instructions for both. In a large bowl (or bowl of a stand mixer, if using), combine yeast and 2 tablespoons of the sugar. Add water, stirring to dissolve the yeast, and set aside until foamy, about 5 minutes. Add the milk powder, salt, raisins, and 3 cups (381 grams) of the bread flour. 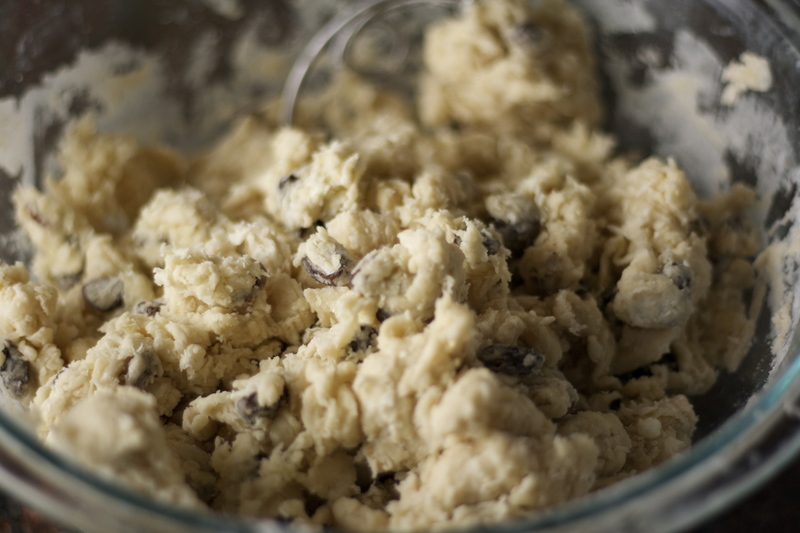 Mix with a wooden spoon or Danish dough whisk until a shaggy dough forms. Mix in the softened butter a bit at a time. Add in more flour if needed to incorporate the butter (473 grams was the magic number for me). 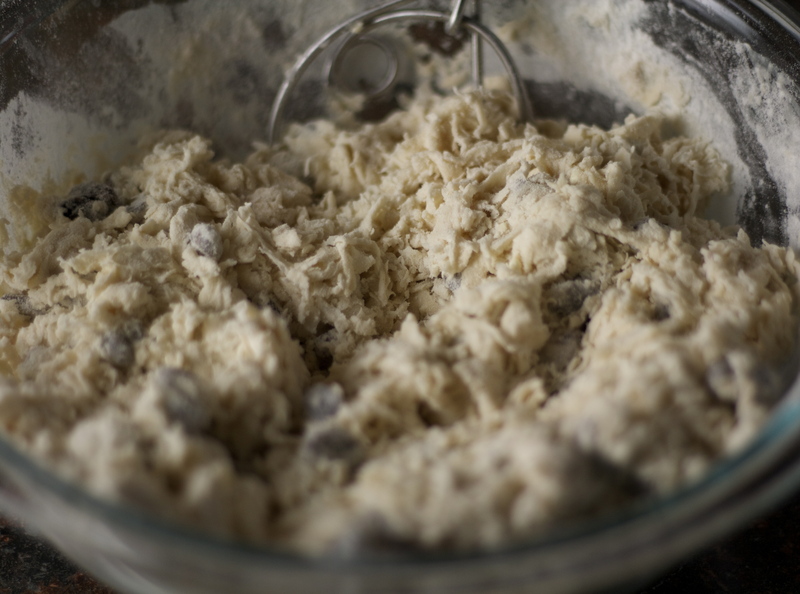 Turn the dough onto a lightly floured counter and knead until smooth and elastic, adding more flour as needed if it’s too sticky, about 10-15 minutes. Form the dough into a large ball, tucking the edges underneath. 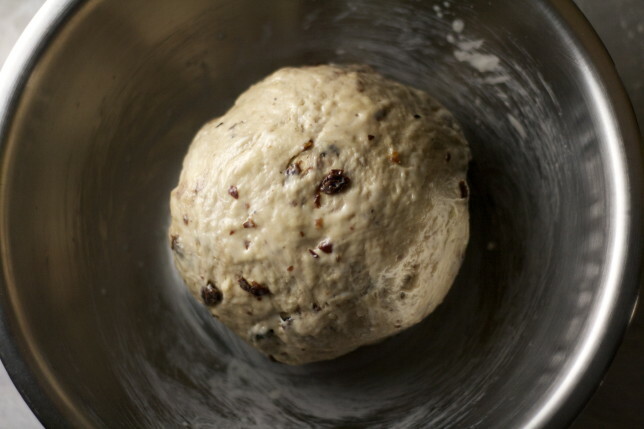 Add the milk powder, salt, raisins, and 3 cups (381 grams) of the bread flour and mix on low speed for 2-3 minutes, until a shaggy dough forms. Add the softened butter a bit at a time until fully incorporated. Turn the mixer to medium and knead until smooth and elastic, about 10 minutes. If, after 5 minutes, the dough sticks to the side of the bowl, add more flour, a tablespoon at a time, until it releases. It should stick to the bottom of the bowl. Turn the dough onto a lightly floured counter and knead by hand a few times into a large ball, tucking the edges underneath. Brush a large bowl with melted butter and place the dough, turning it to coat. Lightly brush the top with more melted butter. Cover with plastic wrap and let rise in a warm, draft-free space until nearly doubled in size, about 1 – 1 ½ hours. Lightly grease a 9 x 5-inch loaf pan. In a small bowl, combine the cinnamon and remaining 2 tablespoons of sugar. Set aside. Turn the dough onto a lightly floured counter and gently press and stretch into a 9 x 12-inch rectangle. 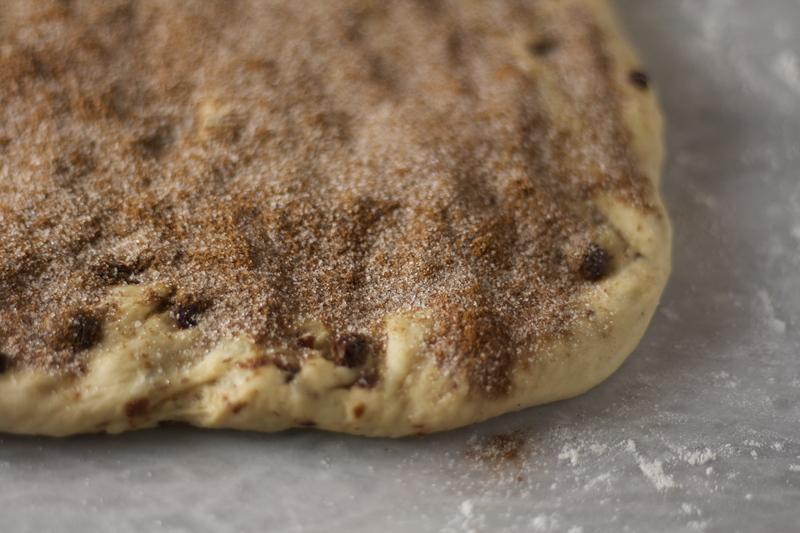 Sprinkle evenly with the cinnamon-sugar mixture and press it gently into the dough. Starting from a short end, roll the dough into a tight log, 9 inches long. Pinch the seam to seal, and pinch together the ends. Place the log seam-side down in the prepared pan and cover lightly with plastic wrap. Let it rest until it rises about 1 inch above the rim, 60-75 minutes. Preheat oven to 350 degrees. 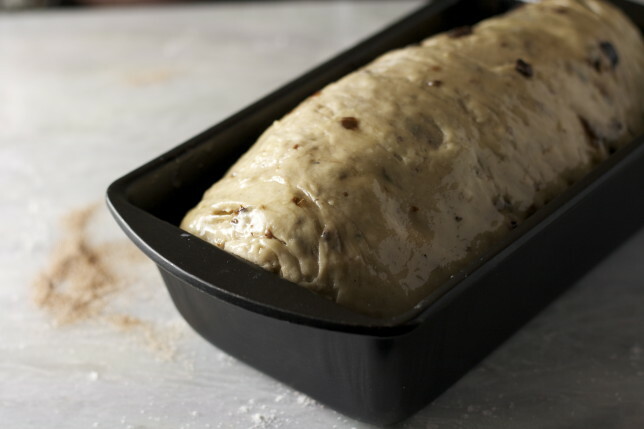 Remove plastic wrap and brush the loaf with the remaining melted butter. Bake until the loaf is deeply golden and sounds hollow when tapped, about 50-60 minutes. Turn it out of the plan and onto a wire rack. Let bread cool for about 30 minutes before slicing. This bread keeps well wrapped in wax paper or plastic and sealed tightly in a plastic bag.